It's been a busy summer in Cycle Chic land and this blog's 3rd Anniversary passed us by back in June. I hadn't forgotten it, I suppose I was just waiting to do something a bit special. A few months back a journalist called the very first photo I took, back on 14 November 2006, something quite humbling and extraordinary. Back then the humble bicycle was not celebrated by the fashion industry and wasn't a hot lifestyle accessory. Now, as we are all witness to, the bicycle is back. Bike is the new Black. And I think it's safe to say that the bicycle has returned to stay, what with the optimistic number of cities all around the world working towards building infrastructure and making their urban landscapes more bicycle-friendly. I decided to make a third anniversary poster celebrating that fact, featuring the photo in question, taken on a chilly November morning on my way to work at Danish Broadcasting. The light had just turned green. A woman is pushing off on the right, a man is in motion on the left. In the middle: a pillar of calm and grace. Back then I didn't notice the bicycle. I saw the street scene, the light, the contrast of motion. What other people saw was the bicycle and the Copenhagener in a skirt looking elegant. The fact that others thought this to be odd was odd to me. It didn't take me long to realise that the bicycle as normal transport had all but disappeared from many cities around the world. It had become only a piece of equipment for sports or recreation, despite the fact the bicycle was transport in cities and towns all around the world for many decades in the last century. People were apparently hungry and ready for a re-branding of cycling as urban transport. The fashion industry subsequently embraced the two-wheeled machine and now we're rolling towards a redefined future. Cycle Chic is nothing new. It's the way people rode bicycles from the beginning of Bicycle Culture 1.0. But the phrase seems to be useful in describing this rebirth of urban cycling. Which is pleasing. The bicycle is back and it's booming. Thanks so much to everyone for visiting this blog and especially those of you who have been visiting since the beginning. 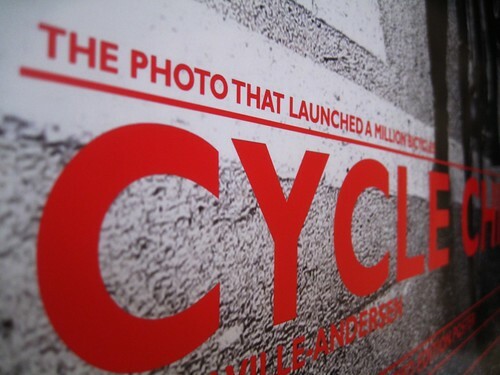 And thank you to all of you who have embraced Cycle Chic and started blogs around the world. Creating a movement of fashion and bicycle advocacy. Cycle Chic is nothing without all of you. I created the poster mostly for myself, to hang on the wall in the hallway here at home. But it's also available online if the idea of owning one tickles anyone's fancy. 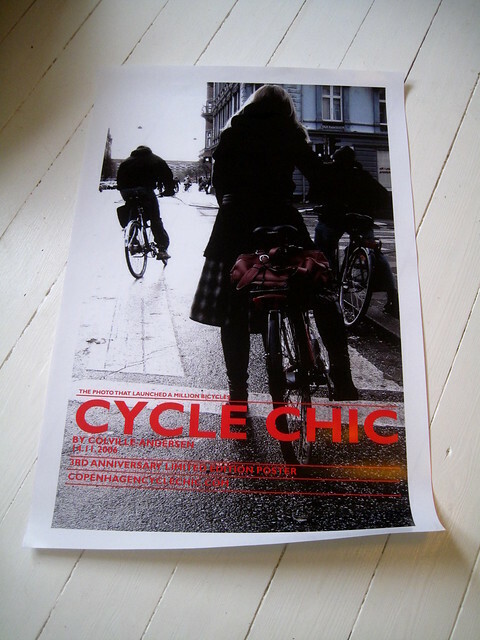 Cycle Chic Third Anniversary Poster. Available online at CafePress. Also as a smaller poster here. it's been a good ride...thank you and keep rolling! Who could believe, behind a "click" would begin a story of redemption from a life-style on two wheels? Quite a way from Copenhagen Girls on Bikes! I must have stumbled across the blog only a couple of weeks or even days after you started. From pictures taken from behind to all angles on ordinary urban biking. I've been so caught up in other things I never made that poster I was intending to do for you. Perhaps I should send you the basic idea and you being a far better graphic artist than myself, you could make something nice of it. Girls and boys, your thang is too beautiful to hide inside a car! Have you ever found out who she was? A couple of years ago I found this site from a link in Flickr. Haven't yet found out who the person was, nope. Smaller size poster is now available in the online shop - 11" x 17"!! Happy, happy from Belgium! Glad to part of the movement! Yay, thank you for the smaller size! Totally going to order one ASAP. Mikael, don't let it go to your head, but meeting you and shaking your hand for what you do to promote "the lowly bicycle" (or as I know it, the best thing ever to come from the hand of man), has made my "Bucket List"! Thanks for all you do!